A cross between a muffin and a scone so we’ll call them scuffins! 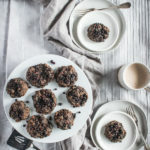 A tasty version of your favorite morning baked good loaded with superfoods like flax, cacao nibs, and wild blueberries. Perfect for breakfast, brunch, snack time, or even a baby shower, bridal breakfast, or Mother’s Day brunch. In a mixing bowl whisk together eggs, melted coconut oil, greek yogurt, agave, and vanilla. In a separate bowl, combine superfruit blend, cinnamon, coconut flour, baking soda, baking powder, and cacao nibs. Add frozen wild blueberries and gently fold in with a spatula. Add more blueberries and cacao nibs to the tops of the scuffins. Bake for 15-16 minutes, or until set. You should be able to gently touch the center of the scuffin without the scuffin sinking in. Allow the scuffins to cool on the pan for a couple of minutes. Then transfer to a cooling rack to cool completely.